Is The Stamina 1215 Orbital Rowing Machine A Smart Buy? – A Review. The Stamina 1215 Orbital Rowing machine is a mid-range hydraulic rower best suited for small workout spaces. The most notable features on this rower include dual hydraulic pistons and a pair of free motion arms designed to more closely mimic the feel of rowing with oars. It also has a sliding seat and warranty, which aren’t always a given for hydraulic rowing machines. But, in a market full of similar products, is there anything that really sets the Stamina 1215 apart from the pack? Is it a smart buy at the current asking price? This review aims to help you answer these questions and more. I want to start off with a quick word on hydraulic rowers in general to make sure we all know what to expect from these machines. 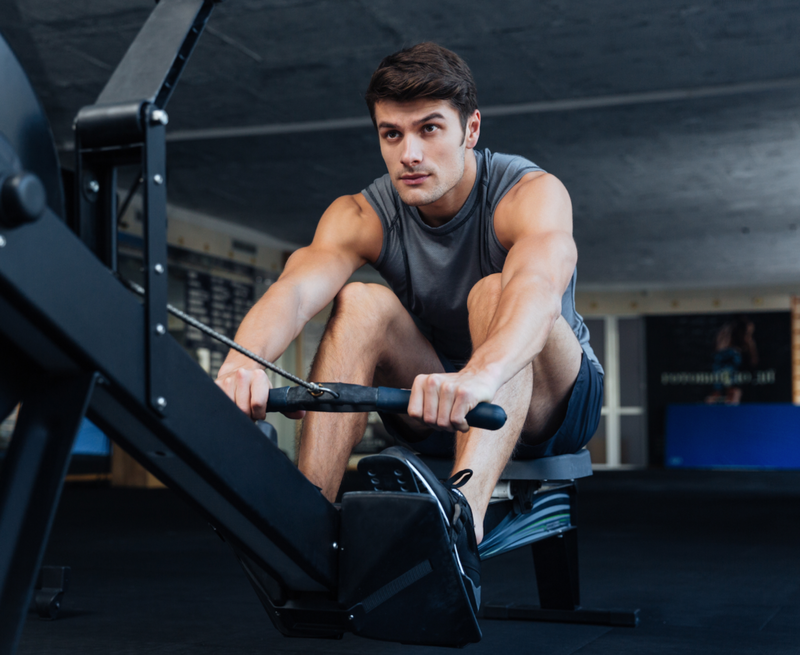 Hydraulic rowing machines get their name from the hydraulic pistons used to provide the resistance you pull against. The other types of rowers are also categorized by the form of resistance used and these include air, magnetic, and water rowers. Each has their own advantages and disadvantages. For more info on these other rowing machines, check out my rowers buying guide. These rowing machines are a lot smaller when compared to air, magnetic, and water rowers (from now on when I refer to “full size” rowers, I’m speaking about these guys). Your average full size rower is usually 7-8 ft long. Most hydraulic rowers are only 4-5 ft long. This provides an obvious advantage for those with limited workout spaces at home. These small rowers open up the world of rowing to folks who once thought there was no way they could fit a rowing machine in their house. The smaller size usually means a smaller weight capacity too. Where some full size rowers can hold users up to 400 – 500 lb, hydraulic rowers usually have weight capacities in the 250- 285 lb range. Larger users are going to have a hard time using hydraulic rowing machines. The resistance is provided by either one or two hydraulic pistons, hence the name. Cheaper rowers usually have a single piston. Dual pistons setups are preferred because they provide more overall resistance- each arm getting its own piston instead of both arms working with one. These pistons can come with adjustable resistance or constant. Most people would prefer adjustable resistance because it gives you the ability to adjust the intensity of your workout. The manner in which the resistance is adjusted can vary. Some rowers allow you to adjust the resistance by conveniently turning a knob on the piston. Others make you adjust the actual position of where the piston attaches to the arm by sliding it up or down and turning a knob to fasten. Most users would probably prefer turning a resistance knob on the piston because its easier and faster, but you usually have to pay a little more this luxury. Full size rowers are expected to have a sliding seat because they all do. This isn’t the case with compact hydraulic machines. The seat on these rowing machines can be fixed or sliding. Sliding seats are preferred because you get your legs working a little harder, making it more of a total body workout. Having the sliding seat also provides a more authentic feel to what most of us probably think of when we think of a rowing machine. That about does, now you’re all experts on hydraulic rowers. Now lets get on with the review! Stamina has been producing affordable fitness equipment for about 30 years now and their catalog has become pretty extensive. The 1215 Orbital Rower is one of a handful of hydraulic rowing machines they offer and while it’s not their most expensive model, it may offer the most features. The 1215 comes with two constant resistance hydraulic pistons. I say constant resistance because the resistance can’t be changed on the piston itself by turning a dial. This rower does have adjustable resistance, but it’s achieved by adjusting the position of where the piston attaches to the arm. There are 5 positions on the bottom of each arm for which you can set the piston attachment. FYI- the bottom position provides the least amount of resistance, but it’s labeled as number “5”. A lot of users have been setting the attachment to level “1” (the highest position) assuming it’s the lowest resistance and complaining that the resistance is too high. Stamina could’ve done a better job labeling them- it makes sense that the bottom setting (the easiest) should be labeled “1”. Regardless, the resistance is adjustable using this method and it does work. It’s not as convenient as having a true adjustable resistance piston, but those models tend to be a little more expensive. Some users have had issues with the bar sliding down to a lower resistance during extended use- a common complaint with these types of rowers. One unique feature on the 1215 is the ability to adjust the incline angle of the rower. You can make your workout more or less intense by increasing or decreasing the the angle of the rail (increasing it essentially makes you row uphill). The seat on this rowing machine does glide along the rail, giving you a more comfortable workout as well as getting those legs involved more. The seat slides freely, but some users are concerned that the rollers are made out of plastic and not metal- the plastic can (and will) eventually breakdown and require replacement. The seat itself is pretty standard. The cushioning is minimal and some users complain it isn’t very comfortable to sit on for extended workouts. I’ve personally never been on any rowing machine that is comfortable to sit on for long rows. Even high-end rowing machines have uncomfortable seats in my book. The “orbital” in the title is referring to the arms. The arms on this rower allow you to row with a wider, more circular arc, similar to the feel of rowing on a boat with oars. This freedom is nice because it allows you to customize your rowing movement more than fixed arms would. If you don’t want to use the wider arc, you don’t have to. You can simply keep your arms in closer to your body and row with a more traditional pattern. Most users agree the arms on the 1215 work smoothly, no complaints. The handles are covered with foam grips for a more comfortable workout. The 1215’s frame is constructed out of steel and the seat rail out of aluminum. Most users agree the compact frame feels pretty sturdy during use with minimal unwanted wobbling. Fully assembled, this rower has the following dimensions: 48″ (L) x 32.5″ (W) x 27.75″(H). As you can see, this really is a small rowing machine. You only need a floor space of roughly 4′ x 3′ to operate. Even the smallest homes should be able to accommodate this little guy. With a weight of about 52 lb fully assembled, it’s not too bad to move around either. Speaking of weight, the 1215 has a max weight capacity of 250 lb. This is pretty standard for hydraulic rowers. Larger users might want to consider the Kettler Kadett, it has a weight limit of 285 lb. The footplates are pretty standard as well, not a lot to say here. They utilize a single, large velcro strap running across to hold your feet in place. They do pivot a little as you row- the goal being to keep your ankles in a more comfortable position as you extend your knees. The movement they provide is pretty small, so you may notice a difference and you may not. Either way, there haven’t been many user complaints about their feet sliding out of the footplates, something that can definitely happen on hydraulic rowers. This rowing machines comes with a small, single-button monitor that displays time, speed, distance, row count, and calories. There’s a scan feature that runs through the different metrics if you prefer. This monitor is very simple and doesn’t provide any of the higher-tech features you might expect from higher-end rowers. I wouldn’t expect much in the monitor department from a rowing machine in this price range, but it would be nice if it was compatible with heart rate monitors (but it isn’t). This isn’t the worst warranty I’ve seen in the hydraulic rower world, but it’s far from the best. For a rower in this price range I’d like to see a longer warranty on the frame especially. 90 days on parts is also pretty weak. For comparison’s sake, the Kettler Favorit costs a little over $100 more and offers lifetime frame and 3 year parts warranties. The Stamina 1215 Orbital Rower is a very compact hydraulic rowing machine that does offer adjustable resistance and a sliding seat. The resistance is a little cumbersome to adjust, but I like the adjustable incline feature for added difficulty. The rower is also fairly well constructed, minus the plastic seat rollers. The full retail asking price for the 1215 is listed as $399. At this price, I can’t describe this rower as a “smart buy” because there are nicer rowing machines for that price. Luckily, if you buy through a site like Amazon, the asking price is a little over $200, which I think is far more appropriate. The biggest downfall of the 1215 in my opinion is the lackluster warranty. I’m also not a big fan of how you adjust the resistance, but other hydraulic rowers also use this method, so I can’t hold that against Stamina. Overall, the 1215 Orbital Rower may work for you if your workout space and budget are both limited. Personally, I think you’d be better off with a Kettler rower if it fits your budget.